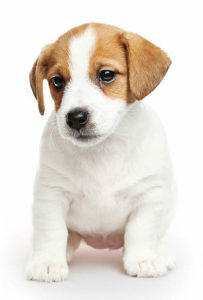 Once puppies get big enough to scamper about, they’re likely to figure out the pet door and how to open it. Sometimes people ask if they should get a smaller door at first and replace it as the puppy grows. Puppies grow very quickly and that would be an expensive solution. You wouldn’t just have to buy new doors – you’d have to increase the size of the hole and re-do the entire installation over and over again. Instead, estimate how big the dog will be as an adult – or wait with buying the door until it is grown – and get the right size at once.